Therapeutic horseback riding and horse facilitated experiential learning. This program is a collaborative effort with area schools providing learning and therapeutic riding for students with a mental or physical disability. Therapeutic riding for individuals with physical, cognitive, and emotional challenges. Equine-assisted psychotherapy for “at risk” youth referred by private therapists, schools, juvenile justice agencies, and residential facilities for troubled and abused children. The Open the Gate Project is a special component of this program that provides equine facilitated psychotherapy for children and youth with emotional or mental illnesses as well as those who suffer from Post-Traumatic Stress Disorder. Healing and wholeness for veterans with emotional, mental, and physical challenges. Triple H collaborates with the Professional Association of Therapeutic Horsemanship International (PATH Intl) Horses for Heroes program, the Wounded Warriors Project, and other veterans’ organizations. Wounded veterans experience physical and mental healing as they rebuild confidence, strength, hope, and honor. Classes include social activities with veterans’ families in order to help veterans reintegrate into civilian life. 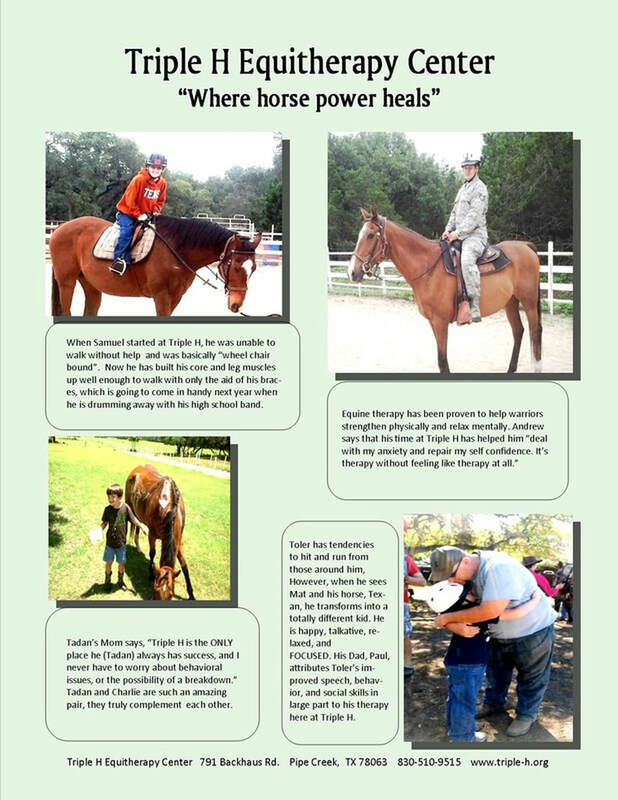 Equine-assisted curriculum consisting of ground (dismounted) activities promoting physical health, emotional healing, and psychological well-being for children, youth, and adults. Program participants often have mental health disabilities, traumatic brain injuries, or Post-Traumatic Stress Disorder. Matching a therapy horse with a senior human can improve the health of both and give new meaning to their lives. Seniors of any age or health condition are invited to participate in our dismounted Horse Power for Seniors program. 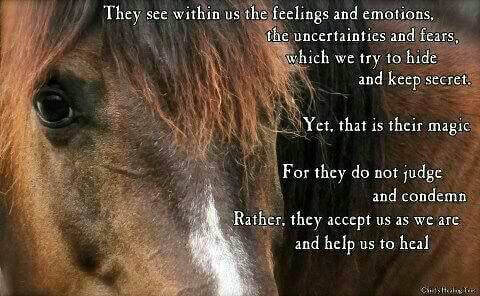 A relationship with a horse engages the mind, the body, the senses, and the emotions at the same time. ​This is the Client Participation, Authorization, Release & Confidentiality Form That Must Be Reviewed Annually. ​This is The Participant's Health History Form. 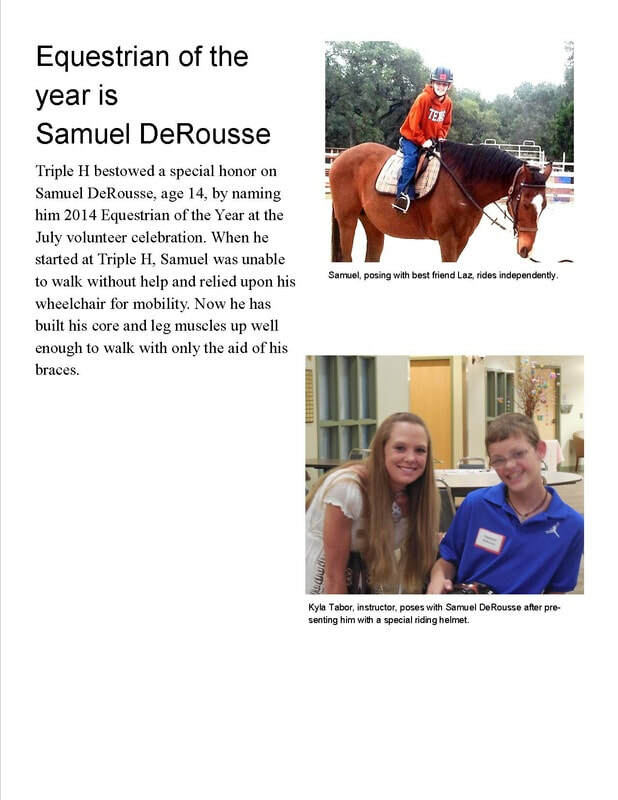 ​TRIPLE H BIG GIVE STORY #1—Read about Hannah, her dad David and her Therapy Horse Coors.